Archive for category: Small and Special! You are here: Home / Mushroom Diary Blog / Small and Special! Small and delicate mushrooms, toadstools and other fungi. Spring is proving slow to arrive, but it’s getting better. 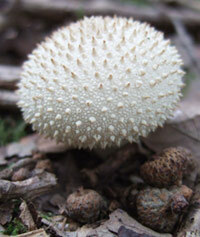 So when the mood takes you, get out on a woodland walk to find yourself some springtime fungi. But in this case, keep your eyes peeled for some pretty spring flowers – you may find some small surprises there! One of the first flowers to bloom are the Anemone, especially the daisy-like Grecian Windflower (Anemone blanda), also known as the Winter Windflower or Balkan Anemone. They appear in violet-blue, pink or white varieties and are very attractive. They often carpet woodland clearings, forming extensive colonies via their underground rooting system. Enlarged structures on their roots (called tubers) are storage organs containing nutrients for their perennial rebirth. It’s here, attached to their underground tubers, that the fungus’ resting body of hyphal threads remains dorment (sclerotum), until ready to produce the Anemone Cup (Dumontinia tuberosa), the only member of the Dumontinia genus. Being a cup fungi it comes as no surprise as to the shape of these small fruiting bodies; but they’re so deeply ‘cupped’ they seem to have more of a bowl or goblet-like appearance. They have rich tan-brown colouring and will expand flatter with age, usually in an irregular fashion. 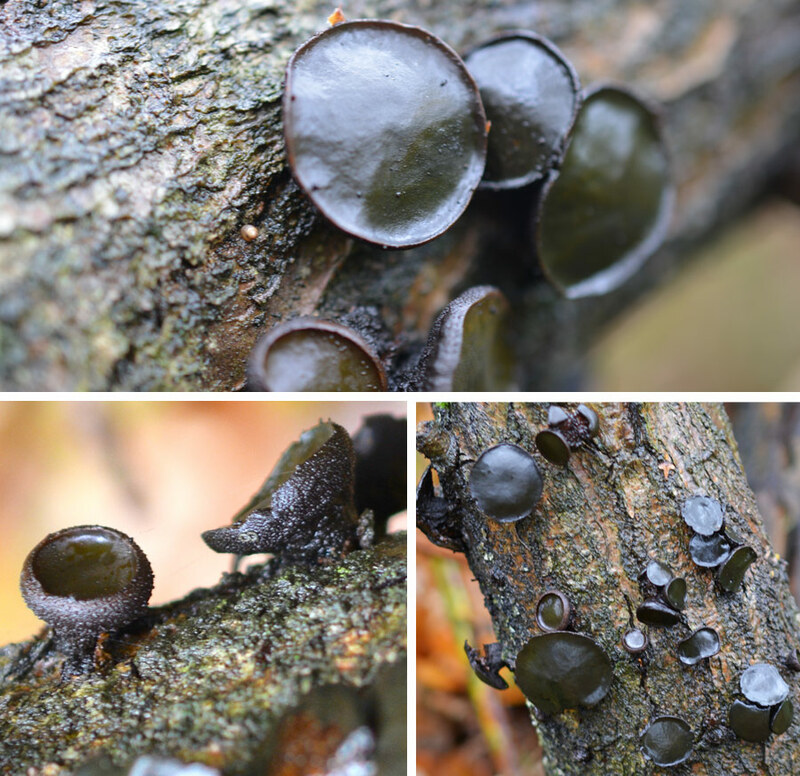 Their appearance at this time may lead you to believe they could be small Jelly Ear fungi, which is quite understandable when you see them. 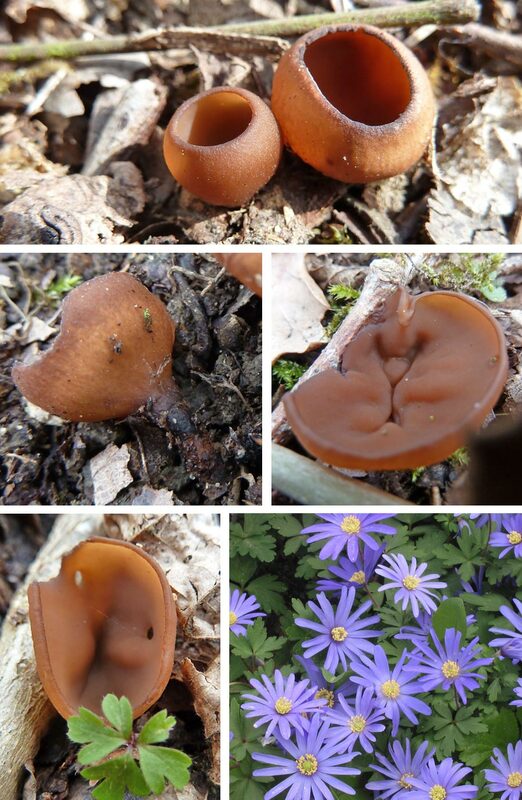 The images shown below only show you a small part of the dark black/brown stem. They’re actually rooted beneath the soil (attached to the tubers of the flower) and can be up to 10cm in length. I’ll try and get a photo of this for next time if I’m lucky enough, as these fungi are considered rare, but this is probably due to the fact that they are often overlooked. No doubt you’ll be more interested in finding Morels for the pan this spring, but it’s always worth a peep amongst these beautiful flowers to see if you can spot one or two; they’ll be around until the middle of May. Happy hunting. 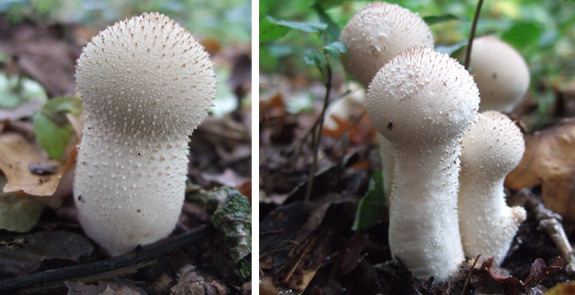 Different growth stages of the Anemone Cup fungus. Bottom right: The Winter Windflower – violet-blue colouring (Credit: Wikimedia Commons from user: Rasbak, Netherlands). A covering of young Wood Anemones (Anemone nemorosa), where the flowers are not yet open. 1-3cm across. Deeply cup-shaped, expanding with age. Tan brown colouring. Long, dark brown/black brown and smooth. Rooting; up to 10cm long. In soil of open woodland. A parasite of the Anemone flower species and sometimes Ranunculus (buttercups, spearworts, water crowfoots etc). Early Spring. Rare. This small and attractive fungus is one of the ‘Discos’ (Disc fungi), an English description for one the groups in the genus of Pyronema (Pyronemataceae family) – but let’s not get too technical, we could be here forever! Although widespread and common throughout the UK, I very rarely see the Common Eyelash (Scutellinia scutellata) on my travels but then again they can be extremely hard to spot, even with their bright colouring. 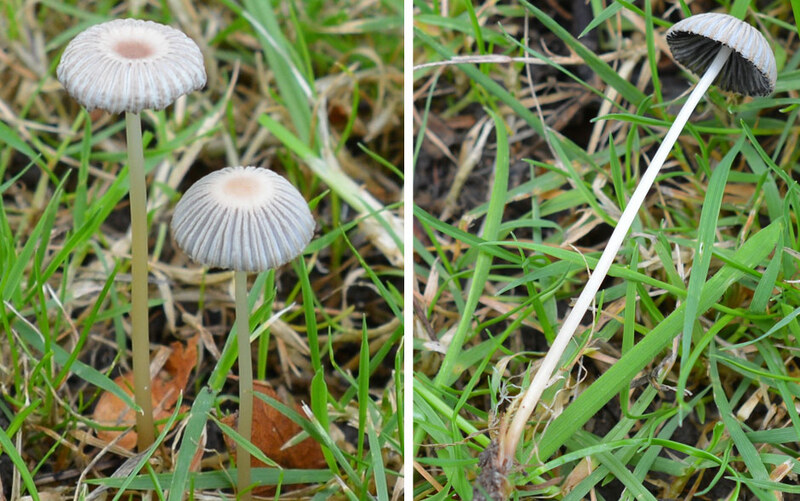 I discovered these whilst kneeling down examining another fungus. Luckily they were in my line of sight. They are often found in groups clustered together on rotting wood or soil, most of the time in damp places and sometimes lost amongst moss. They measure around 0.2 – 1cm across, so finding a solitary individual would be very hard indeed. Apart from the bright orange/red colour and mini disc/shallow cup shape – the main distinctive feature are the tiny fine dark brown/black hairs (up to 20mm in length) on the margin. They look like tiny ‘eyelashes’ all around the edge, hence the English name. Depending on how good your eyesight is, these are just visible with the naked eye and look quite menacing through a lens. Fortunately these fine hairs are not sharp and cannot penetrate the skin. 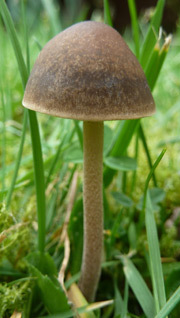 Many cup shaped fungi have similar growing hairs around their edge and they differ in length and colour etc. Similar species to the Common Eyelash include Scutellinia umbrorum / S. olivascens which share the same colours and environment, but are larger in size (up to 2cm across) and with shorter, less conspicuous hairs. Their season is late spring to late autumn, so keep a keen eye out and you could get lucky. Scutellinia scutellata – The Common Eyelash Fungus. 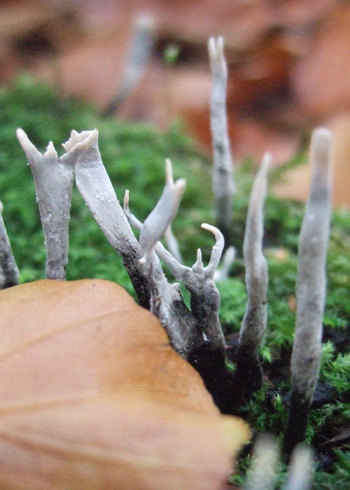 Often found in groups on damp rotten wood sometimes amongst moss. This is the Amethyst Deceiver (Laccaria amethystina) can be found in troops on the ground with conifers and broad leafed trees, in fact all types of woodland. Their colour strength changes depending on the weather conditions. For example, when wet or damp, it’s quite possible you may walk past many of them as their violet colour deepens and merges into the undergrowth background. I must have walked by quite a few as they’re extremely common in autumn. As they age, the colour fades to a pale buff. They are a very pretty, small mushroom and people who notice them always take a second glance. I’m not surprised as it has such a distinctive and beautiful appearance, even though on the small side! 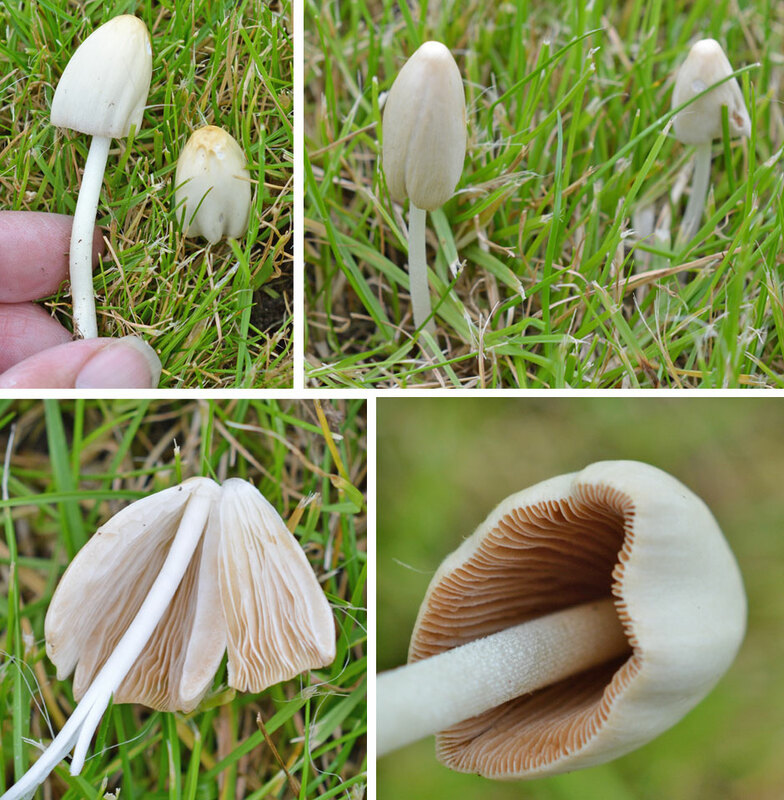 Their stems are tough and sometimes bent or twisted and the cap can be variable in appearance – sometimes perfectly convex and often wavy edged and irregular (see the pictures). 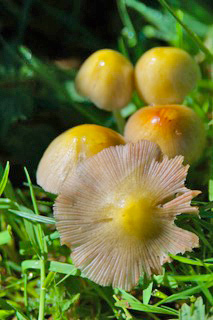 The gills are widely spaced and if you take a spore print – it will be white. (How to make a mushroom spore print). 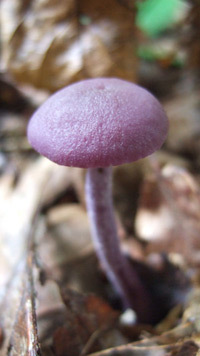 I’ve always found the spore deposit result of great interest because I have seen pictures of a very similar toadstool – The Lilac Fibrecap. 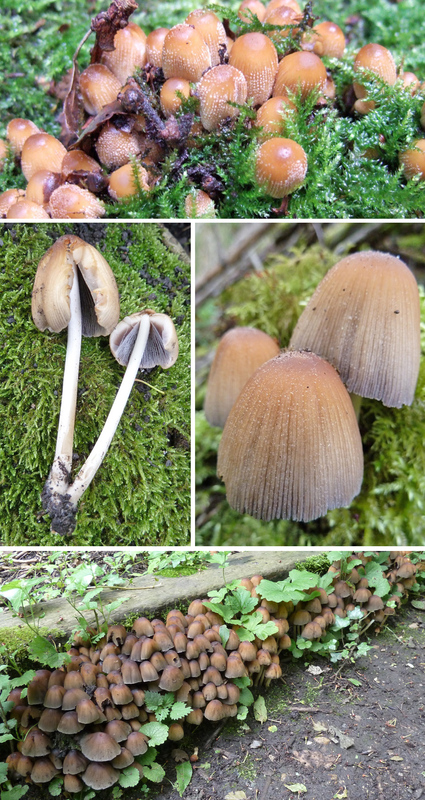 The Fibrecaps (Inocybe genus) are a nasty bunch of buggers and most of them are poisonous, and one at least being deadly. But in this case our only concern is the similar Lilac Fibrecap. It isn’t deadly but it’s one to avoid anyway. This is where the spore print can really help. The Lilac Fibrecap has a ‘snuff’ brown spore print and our lovely Amethyst Deceiver has a white spore print. Thank the Heavens for spore prints. So, as you’ve guessed, the Amethyst Deceiver is indeed edible but seriously lacks in flavour. 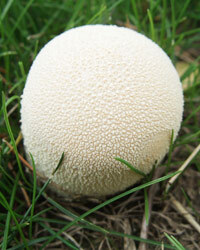 It can be added with a load of other species of tasty fungal treats you might have, but on it’s own it’s not worth it. I believe it’s very good for adding colour to extravagant salads. Hmm! worth a go I suppose. 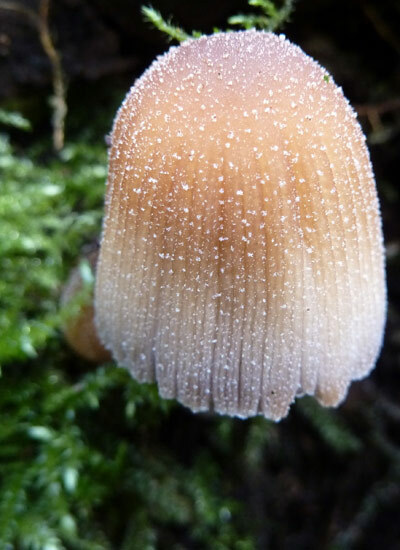 One more thing before I sign off – Another similar species is the Lilac Bell Cap or Lilac Bonnet (Mycena Pura) and contains the poison ‘muscarine’ although it’s not deadly in this specimen, in fact I have read one specialist book claiming that this mushroom/toadstool is edible! It does has a white spore print, but don’t despair too much. In comparison, it is a little larger, the gills more crowded and the cap more bell shaped. The colour varies from lighter shades of lilac and pink, although younger specimens may appear darker in this colour. The ‘key’ giveaway is that the cap edge is much more grooved (striate at the margin as they say) – so take care in checking. 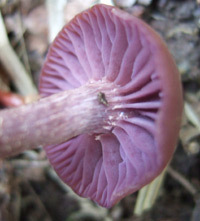 The Amethyst Deceiver can have an irregular shaped or perfectly shaped concave cap. It can dry to a pale violet colour as seen in the right hand image. 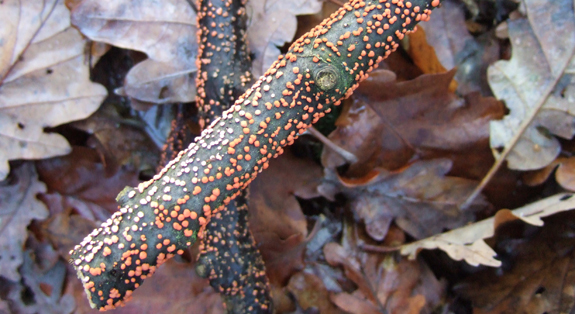 Although tiny (0.5 – 1.0mm) the orange fruit bodies of the Coral Spot (Nectria cinnabarina) grow in their hundreds mainly on small dead twigs and branches (wood piles etc.). Even if you’re no mycophile, not many wood walking people can say they haven’t noticed these little critters blossoming just about everywhere throughout the year. And myself, as a fan of all thing fungal just had to know what they were. So now we know. 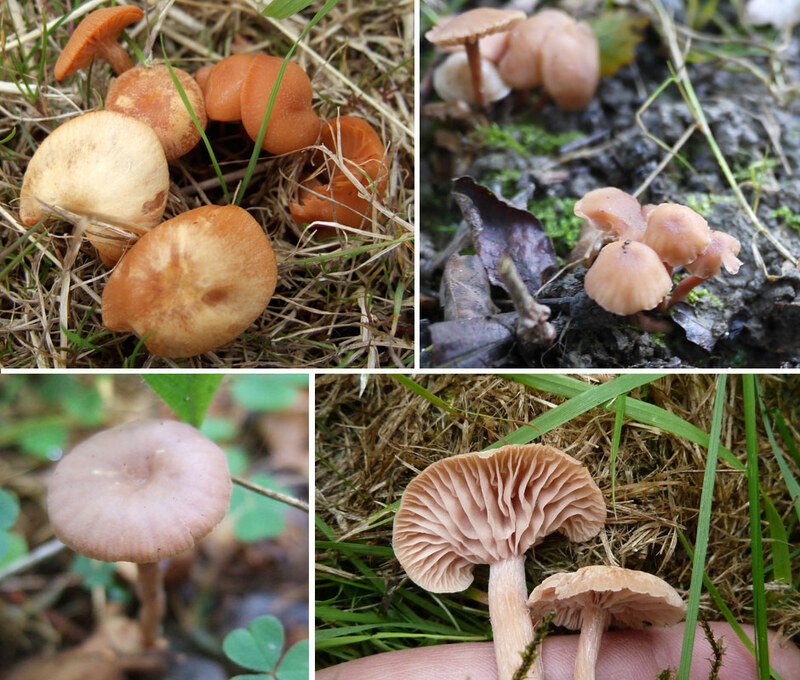 One mushroom guide I have noted that the ‘non-sexual’ form is the most common found, as in these pictures shown below. The ‘true’ sexual form is dark red/red-brown which has a bumpy surface and both forms usually grow together. We’re getting into the sexual side of things I know – and don’t ask me too much on this subject, I’m still getting my head round the other mysteries of mushrooms! Anyway. Here’s the picture. You know you’ve seen them before don’t you!? Note: This shot was taken in November 2009. Look out for these common orange spots in the woods anytime. One last thought – I know Coral Spot is classed as inedible, mainly due to them being insubstantial (I believe). But imagine if you will, what if somebody took the time and collected thousands of them, just enough for a good portion – what would it really taste like? I’ve read elsewhere that it’s taste and odour have no distinction – but I think if you really had a munch on a big batch of the stuff, you might get a different result! Well, maybe not! Just a thought.